Marilyn, town centre, 5 minutes walk to sandy beach, inside palace 1700, free wi fi. 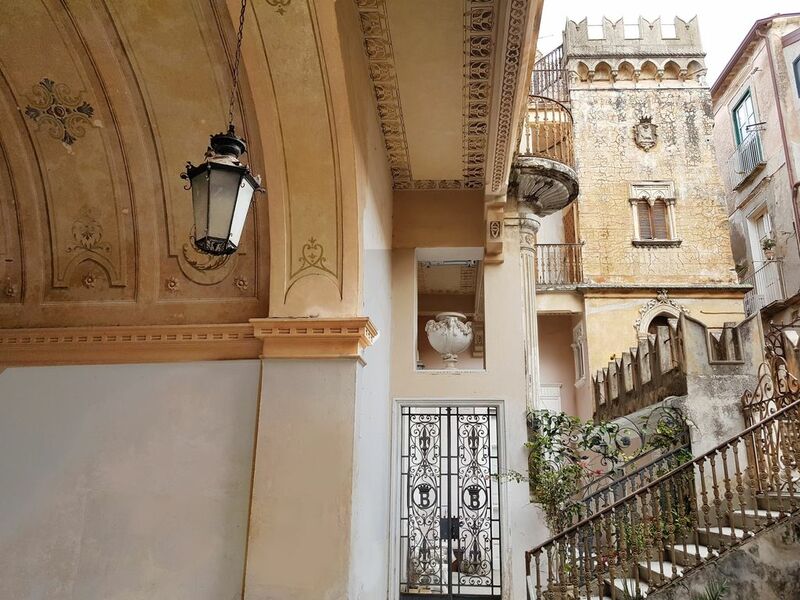 This apartment, called Marilyn, is the ideal place for 2-4 people, inside palazzo Bragho', 1721, right in the heart of Tropea town centre, 5 minutes walk to the sandy beach, 10 min. walk to train station and free parking. The price includes: water, electricity, gas stove, bed linnen, bathtowels, final cleaning, internet broadband wi fi, discount card, map, beach umbrella to take to the public sandy beach. Downstairs: fully equipped kitchen provided with table and chairs, tv/sat and wardrobe + indipendent bathroom with confortable cabin shower. Upstairs: beautiful wood sleeping loft equipped with one double bed + 2 single beds, wardrobe, small window and ceiling fan. Check in is after 14.00 - check out is before 10.00, (if your train or plane is after 10.00 you can leave your luggage here and get it before leaving). Upon arrival we provide our guests with the town centre map (including information of the streets, shops, restaurants, tour agencies, and more, we also add the discount card which can be used for special discounts on the price list at local restaurants, pizzerias and other stores. Check flights to LAMEZIA TERME INTERNATIONAL AIRPORT, and then 50 minutes local train trip to TROPEA or TAXI upon demand.. I am Pasquale, languages teacher. free use of the computer with free internet access. Free broadband wi-fi. "The location couldn''t have been better, the studio had everything I needed. I felt at home. The owner, Pasquele, couldn''t have been more helpful! He went above and beyond to help me get information that I needed for a project I was working on. What a lovely town! I look forward to returning with all my friends!" "After reading the description, seeing the pictures and after the booking we were hoping for all to come true... It did so and even better! The palazzo Bragho, the owner (his family) and the entire town off Tropea have all pleased us more than well during our two weeks stay. "We had a very enjoyable stay in a most wonderful location. The apartment was exactly as described. Pasquale was available at most times and was kind and very helpful. Bravo e grazie"
"Lovely, quiet area close to all facilities. Pasquale very helpful and reliable and came to pick us up at train station in nearby town." "The apartment was unbelievably central - just minutes walk from the beach, marina and town centre with all its shops, bars, restaurants and amazing views over the bay. Pasquale and his family are so friendly and helpful, picking us up from the train station, letting our daughter stay to play with their daughter when she didn't want to come shopping with us, and even inviting us to share their umbrellas on the private beach." "A truly wonderful location, the apartment and Tropea. Pasquale was helpful in every way, a gracious, giving host, beyond the call of duty. Apartment was clean and spacious and of course unique. Can't wait to come back."